“Those aren’t “níhcaloh,” José commented matter-of-factly in his thick Huelvan accent as he pointed out his collection of orange fungi skewered on a stick. “But you said they were orange, these are orange.” I replied. And they were. But they weren’t “níhcalo”, or in proper Spanish, “niscalos”. Saturday, Beth and I went with our friend José to the “campo” (country) to have a picnic while he did some measurements of a lot in the “bosque” (forest) for his job. Upon arriving, José- a very simple, no-nonsense wilderness type- simply said, “You two go pick mushrooms.” So we did! Autumn is mushroom picking season here, so we were excited to find our little niscalos. Pretty hilarious! I would love to say that these were our níscalos, however Beth and my endeavors were unsuccessful and we only found tiny white ones that were inedible. Go figure… We had fun, though, and it was refreshing to leave the city and be in the country, finding out about nature and breathing in fresh air. It was the day of 20 million questions as my curiosity about the forest, the pine trees, the plants, and other things was soaring. So, all in all, a great day in the country, picnicking, skipping around, hunting for mushrooms, and expanding my inner collection of pretty-useless-but-somewhat-interesting knowledge. Such as: Spanish farmers kill American ducks that appear in Spain because if they mate with the native Spanish ducks, that species will disappear since the American duck’s genes are the dominant ones. 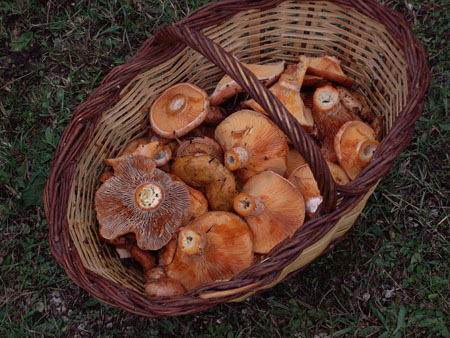 Or, you don’t put níscalos (or other mushrooms for that matter) in a plastic bag, but rather in a basket so that the spores can spread while you’re picking them.